Wozniak participated with his friend Allen Baum and his imagination was struck most of all by Altair’s Intel 8080 microprocessor. Suddenly, he had an insight. That same night, after the HCC meeting, Wozniak started to sketch out (on paper) the schematics of what would later become the Apple I. For months every night Wozniak would head back to Hewlett Packard (where he was an employee) to labor on his project, figuring out which components to use, and how, and to write the software code. He showed his computer to Steve Jobs, who peppered him with questions about its potential and expandability, helped him obtain components and showcase it around. Nine months later, on April 1, 1976, Wozniak and Jobs met with HP colleague Ron Wayne in his apartment, and drew up a partnership agreement: Apple was born. 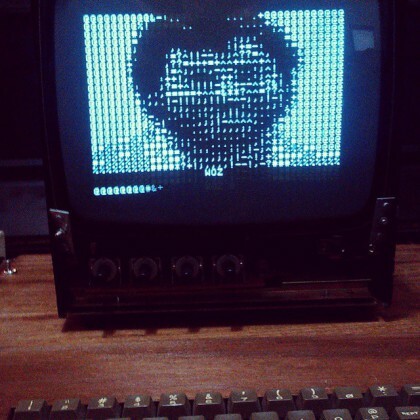 Note: The image of Wozniak in ASCII ART is from the Instagram account of Verde Binario, the MIAI (Museo Interattivo di Archeologia Informatica) in Cosenza, Italy. “ADAM McCRANIE: Why did you use the 6502 microprocessor in your design?